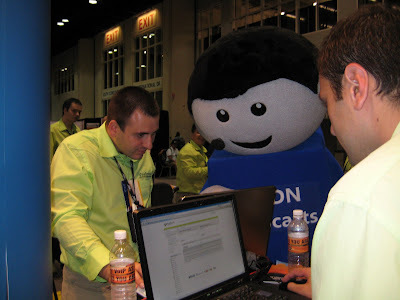 Telerik, as you already know, is in full force at TechEd 2007 and so far this year's event is going very well. There are 11 of us from the Telerik team in Orlando this week, 9 of which made the long journey from Bulgaria to come show-off the latest and greatest we have to offer (like a preview of the new RadScheduler for RadControls "Prometheus" and some never before seen Silverlight previews). I will be making a few updates this week from the event- in fact, as I type this I'm sitting in our bright booth watching the hordes of attendees gather, waiting to be released on to the expo floor. 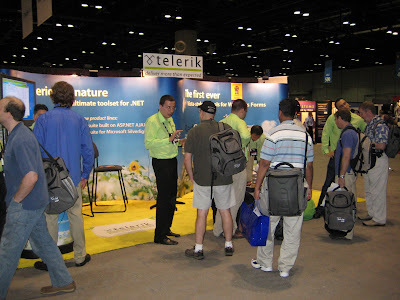 For now, I'll leave you with a pics of the Telerik booth and crew and bring you more details on the demos we're doing here (along with some more photos) later this week.